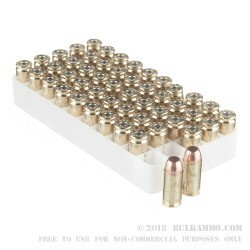 A great range duty ammunition with a proven history of being a proud favorite of law enforcement for the reliability and accuracy and affordability it offers in a full metal jacket design. The TMJ (total metal jacket) offers a cheap, simple projectile in 155 grains for the widespread .40 S&W cartridge. Brass cased, Boxer primed, no frills, and it shoots a bit dirtier than other .40S&W target/practice ammunition. 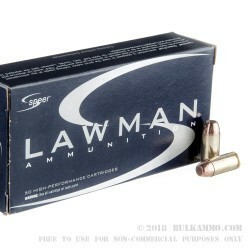 The point isn’t that it’s a bit dirtier ammunition: it is that the ammunition by Speer Lawman Line is a fantastic value, and you don’t have to sacrifice much to get it for so little out of pocket. The relatively good ballistic numbers keep this round functioning in most modern firearms. They are as follows: 1175 feet per second velocity and 475 Ft. Lbs. of energy. 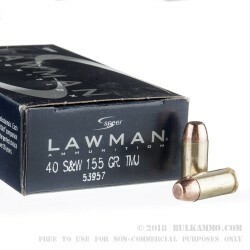 The powerful functional reliability of the Lawman line is a determining factor in it being a perfect law enforcement training round. It’s predictable, strong, albeit a bit boring. But who needs fancy ammo for the range when they already have tons of practice time with their duty weapon? 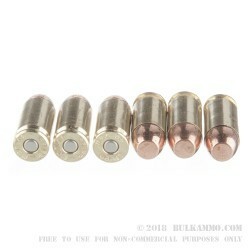 This is suitable for use in any .40S&W firearm, rifle, carbine, pistol or otherwise.